These powerful FlowXtreme® Prime Replacement Pumps for Above Ground pools feature corrosion proof polymer construction that will deliver years of reliable service. This high-performance pump is quiet, efficient and self-priming. This design fits most filters and the large clear lid allows for easy cleaning. Replace your old inefficient pump with this water moving monster. Comes with 6-ft cord. EASY OPERATION - With self-priming functionality and a clear, easy-to-clean lid, you'll enjoy premium performance with minimal maintenance. 1.5HP - The FlowXtreme Prime attaches to any standard, 1.5-in fittings. This reliable pump filters up to 6,950gallons per hour up to a max head of 55 feet, outfitting a wide range of above ground pool systems. .75HP - The FlowXtreme Prime attaches to any standard, 1.5-in fittings. 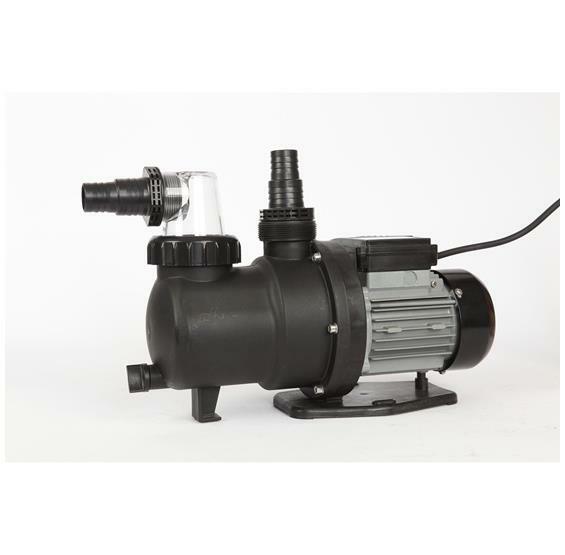 This reliable pump filters up to 2,300 gallons per hour up to a max head of 30 feet, outfitting a wide range of above ground pool systems. DEPENDABLE DURABILITY - With a corrosion-proof polymer construction, this self-priming pump provides years of dependable, efficient performance. Upgrade your above ground filter system with the FlowXtreme Prime. This 3/4 HP pump pushes 2,300 gallons/hour of filtration up to a max head of 30 feet. With a quiet, heavy-duty motor and corrosion-proof construction, this pump is perfect for above ground pools. Whether running your vacuum or other accessories, you can expect dependable, long-lasting performance. The FlowXtreme Prime's 1.5-in pipe size fits most filter systems, and its large, clear lid makes cleaning easy. Choose this commercial-grade, single-speed pump available at residential costs, and enjoy a summer of worry-free operation. Replace your old, inefficient pump with this water moving monster. Comes with a 6-ft cord, and backed by a 1 year warranty. Its energy-efficient, reliable 1.5HP motor pumps 6,950 gallons/hour with minimal noise and maximum efficiency. You'll enjoy years of premium performance with the FlowXtreme Prime's corrosion-proof, polymer construction. Replace your old inefficient pump with this water moving monster, and enjoy clean, quiet, cost-effective filtration. Replace that leaky, low flow rate system with FlowXtreme Prime and enjoy cleaner water and trouble-free operation. The FlowXtreme Prime's 1.5-in pipe size fits most filter systems, and its large, clear lid makes cleaning easy. Choose this commercial-grade, single-speed pump available at residential costs, and enjoy a summer of worry-free operation. Comes with 6-ft cord and backed by a 1 year warranty.